Disruptive Behavior Disorders (DBD) is behavioral disorders characterized by hostile and defiant behaviors that children and adolescents direct towards others. There are various forms of disruptive behavior disorders, two most common forms are Conduct Disorder (CD) and Oppositional Defiant Disorder (ODD). ODD is characterized by hostility, defiant and disobedient behaviors directed towards parents, teachers and others. In CD, person shows persistent and repetitive behaviors, violating the basic rights and causing social disturbances. Behavioral symptoms like social isolation, lying, stealing, bullying etc. Cognitive symptoms such as difficulty concentrating, frequent frustration, memory impairment etc. Psychosocial symptoms include lack of empathy, persistent negativity, irritability etc. 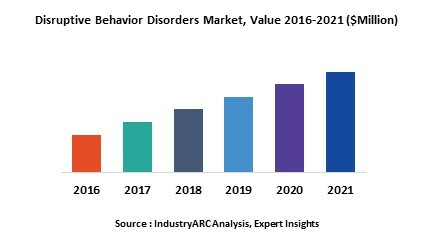 The global disruptive behavior disorders market is being driven by the rise in the number of comorbid disorders, active involvement of NGO and government programs to increase awareness. However, the poor rate of diagnosis and the improper treatments are the restraining factors for the market. DBD market is segmented into North America, Europe and Asia Pacific and other countries. In USA CD affects 1-4% of adolescents and ODD is estimated in 10.2% of children. DBD is majorly seen in boys than in girls. Government initiatives, increased awareness, availability of effective treatments are the factors driving the market growth in US and EU. In Asia Pacific region, major drivers are growing population coupled with rising prevalence of behavioral disorders. As per WHO estimates, China constitutes 15 million cases of behavioral disorders. 13.2. Eli Lilly and Co.